I am not the kind of person who makes resolutions for the new year. And even if I do, I am not the kind who reveals them to people around me. Considering how lazy I am with following beauty regimes and splurging on expensive beauty products, my dearest sister decided to gift me something. So when she went to London for some work commitment, she bought me these 3 products. Though I was not too happy(greedy me), as I would have really loved some cool and stylish dresses and tops; I decided its finally time, that I start doing something for my skin care regime. So starting this year, I have started using all these 3 products. 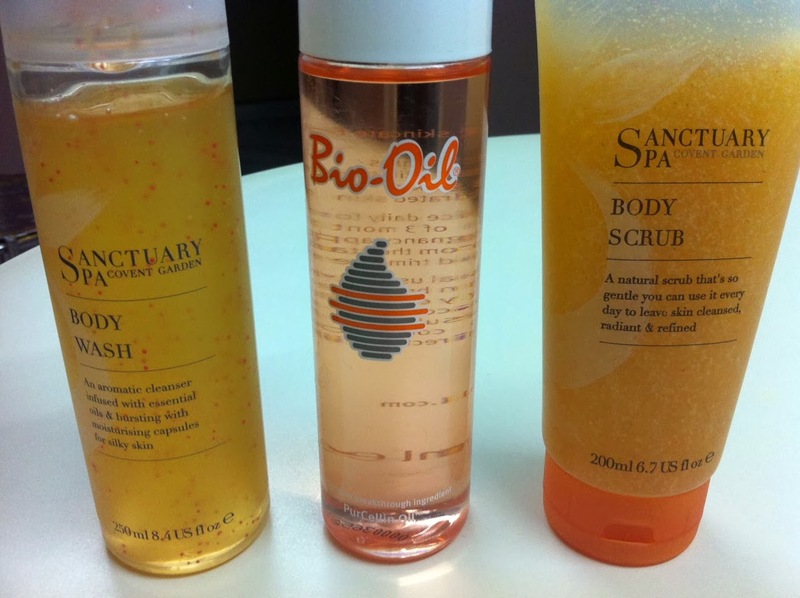 As per instructions I use the Bio Oil, twice a day, the Body Wash once a day and the Body Scrub once a week while bathing. Though I see no evident changes yet, I am just going to be patient (or act so), and wait for 3 months. After 3 months I promise to do a review of these 3 products for my readers sake. Till then I pray that I can stick to this regime and start glowing till the end of the 3 months. Fingers crossed. I ll wait for the review of the bio oil. Want to get rid of marks. Hope it works.